The Sensors Show in Rosemont, near Chicago USA, is a regular annual event in June, but Walt Boyes of ControlGlobal.com reports that the show seems to be shrinking, year on year. However, one of the suppliers to the sensor industry that attracted Boyes’ attention again this year was Perpetuum, the UK-based supplier of electromagnetic vibration energy harvesting devices that can power wireless sensors. Last year at the same show, Perpetuum won a “Best of Sensors Expo 2010” award in the technologies category, for their PMG FSH free-standing Harvester, optimised for industrial machinery asset condition-based monitoring. “The combination of our low power SmartMesh products and Perpetuum’s energy harvesting technology creates a system that can run indefinitely without maintenance, which further enhances the ROI of WSN solutions”, added Joy Weiss, president and ceo of Dust Networks. April this year saw a full press announcement by GE Measurement and Control Solutions, who are the suppliers of Bently Nevada systems. In this, GE claims that Essential Insight.mesh 1.1, the latest version of the Bently Nevada wireless condition monitoring solution, offers the world’s first electromagnetic vibration energy harvester powered sensor mesh network, which eliminates the need for batteries and associated maintenance. This external power source is also quoted to allow the selection of more frequent data collection, therefore meeting a broader range of applications. “The addition of Essential Insight.mesh 1.1 is another example of how GE continues to invest in wireless technology and enhance our current solutions,” said Sean Coyle, Bently Nevada Product Line Manager. “The addition of these features provides our customers with flexible options and alternatives to the traditional battery powered device.” Significantly, the release also advises that Essential Insight.mesh platform has Zone 0 hazardous area certification, allowing deployment anywhere in the plant. Each device supports four measurement channels with up to six types of displacement/vibration measurement per channel, including acceleration enveloping, overall value, waveform, and spectrum. For the Sensors Show 2011, Perpetuum were able to announce a further commercial offering of their energy harvester power source, from National Instruments, with their WSN-3226 Wireless Measurement Node, which is suitable for voltage or resistance measurement sensors, such as RTDs and potentiometers. “As a leader in the wireless sensing and industrial automation market, NI is excited to offer Perpetuum’s vibration energy harvesters as a solution to battery replacement for our WSN nodes,” said Nick Butler, Product Marketing Manager for Wireless Sensor Networks at National Instruments. “This solution can significantly reduce maintenance logistics and costs for customers.” NI also offer a solar powered WSN node for outdoor batteryless wireless monitoring systems. 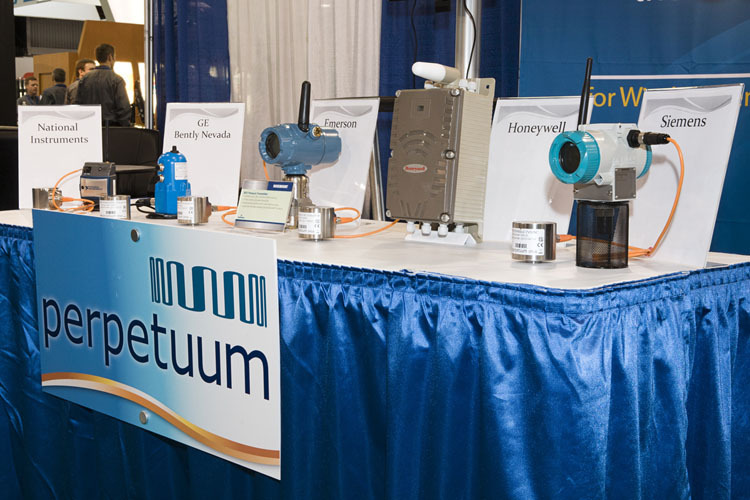 From the Perpetuum product display at the Sensors Show, it would appear that there are a few more suppliers of wireless sensors and systems testing the Perpetuum vibration energy harvester as a power source. The picture indicates potential further use with pressure transmitters from various sources, and what would appear to be a wireless gateway! For Perpetuum, the next big event will be the ISA Automation Week in October, so maybe further applications of energy harvesters will be revealed then!